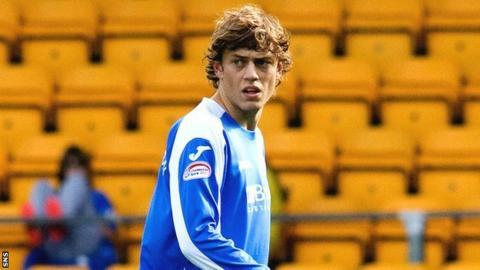 Runners-up spot in the Scottish Premier League is the target for St Johnstone's Murray Davidson as he most likely nears the end of his stay at the Perth club. Saints are fourth, a point behind Inverness in second, and Davidson, 24, is eyeing a strong end to the campaign. "Why not?" he said of finishing second. "It would be a good way to end. "At the moment it does look like it's going to be my last season here. It would have been good to get a wee cup run but our focus is on the league." That gave St Johnstone 40 points from 28 games and, although Steve Lomas's side are just three points clear of Kilmarnock, Aberdeen and Dundee United in spots seven to nine, Davidson prefers to look up the SPL table. "We're in the final stage of the season, five games before the split," said the former Livingston midfielder. "It's so tight, a couple of wins and you can put yourself in a strong position, and a couple of defeats, like with Motherwell, and you can drop a couple of places. "The team that from now until the end of the season goes on a wee run and is the most consistent will nick it [second place]. "Hopefully, for me personally and for the team, we can end the season on a high." Despite being unable to play in it, Davidson is now keenly anticipating the midweek league trip to Dundee, who have appointed John Brown as their interim manager. "We earmarked this as a big week and we have got off to a good start. We go again on Wednesday," he added. "Unfortunately, I am suspended but it's a massive game for the club." Second and third-place finishes in the SPL will provide Scottish clubs with a chance to qualify for the Europa League group stage. The Saints' first two competitive matches this season, back in July, were Europa League qualifiers and resulted in a 3-1 aggregate defeat by the Turks Eskisehirspor. "You've got to set your targets high," said the Scotland international of European qualification. "It's so tight. There are probably six or seven teams that are thinking the same thing." The match against St Mirren was no classic, with the first half in particular short of good football and goalmouth action. But after the interval, Rowan Vine pounced to knock the ball past Craig Samson in the St Mirren goal a split second after Davidson had a prod at goal thwarted. That proved to be the winner, though St Johnstone hitting the woodwork on three occasions in the second half suggests they just about merited the three points. "Recently it's been stop-start for me with injury. I was desperate to get back involved," Davidson said after the match. "I didn't do the full training yesterday so it was touch and go but I managed to play and I am delighted with the points. "We said before the game that it was one of the biggest games of the season. "There was never going to be a lot in the game and we've sort of been due that, sneaking a 1-0 win, and I thought in the end it was probably deserved. "Sometimes it's more satisfying to win those games 1-0 than winning 3-0 or 4-0. That sounds silly but it's a very happy dressing room in there." You can follow Keir Murray on Twitter.